The best part about being, say, under the age of 11 is that you get to order off the kid’s menu in restaurants. The main course offerings of kid’s menu are not the terribly exciting. In fact, many such menus are limited to plain hamburgers, grilled cheese and french fries. No, the thing that makes me nostalgic is the free dessert that comes along with the meal. I will admit that it isn’t usually anything exciting, but what kid could resist a restaurant meal that includes dessert? The most common dessert wass a scoop of vanilla ice cream, occasionally turned into a sunday with a bit of fudge and whipped cream, but I would always order a dirt cup when it was on the menu. A dirt cup is a layered dish of chocolate pudding and chocolate cookie (or cake) crumbs that vaguely resembles a cup of dirt. This similarity is played upon with the inclusion a few gummi-worms. I will freely admit that I actually ordered the dessert for the gummi worms alone. I still eat them first. 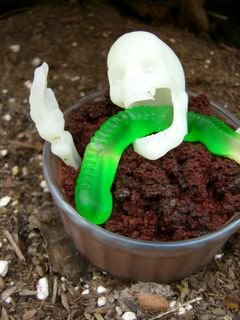 This dirt cup may not trick anyone, but it makes an adorable dessert for kids of any age and a fun one for grown-ups on Halloween.There is no recipe for these, just put some chocolate pudding into a cup and top with crushed chocolate biscuits or cake crumbs. I used an extra cupcake I had frozen a few weeks back. Top your dirt cup with gummi-worms and any other appropriate decorations you have on hand. If you’re a Harry Potter fan, like me, perhaps you’ll notice that my dessert bears a striking similarity to the dark mark. What could be spookier? The first time I had one was for a baby or bridal shower for someone at our church, about sixteen years ago. They were served in flower pots…it was great. I’m still waiting for some company to come out with pectin-based worms; I really miss gummi candies! Those are great! I really wanted to make lots of treats for Halloween, but I got to busy and none of them happened. Now I have an archive of them from your site I can come back to next year! Thanks! I love your Halloween spirit! I’m celebrating the Twelve Days of Halloween on my blog: http://toastpoint.blogspot.com. I haven’t been as entrepreneurial with homemade creations, but my enthusiam makes up for my effort–or lack thereof. I love the Harry Potter Dark Mark touch. It is certainly creative! I used to love eating these, too, when I was a child. Of course, that was before I started counting the calories, but your post brought back fond childhood memories. Yumo! I haven’t had these in years. I think I’ll make a couple of these this weekend when I have a few friends over. I am making these for a garden themed spring party for my five year old. It sure is cuter than plain old cupcakes! Dirt cups are the Sh**. Especially when you’re hungry….